Technology has changed the way we do just about everything, from business to everyday life–so isn’t it about time that tech starts changing the healthcare industry, too? Today we’ll explore what video conferencing could mean for doctors and specialists–and patients–everywhere. Video conferencing has a lot to offer to any industry. It is fast, reliable, and easy-to-use, making it a great choice for businesses of all shapes and sizes. By utilizing more efficient technology and cutting down on travel time and all the complexities of large-scale meetings, video conferencing makes it easier than ever to communicate, collaborate, learn, and succeed. If you want to see exactly what video conferencing can do, just look at the ways it could help in the healthcare industry. Both patient and doctor are on a schedule, so it makes sense that video conferencing should be able to save the day. By eliminating travel time, video conferencing makes it possible for doctors to spend more one-on-one time with each patient. Without video conferencing, it can be difficult or often impossible for patients on one side of the country to see specialists on the other side. Luckily, video conferencing makes it possible to connect people from anywhere, no matter what the circumstances. Doctor’s office anxiety can be a real strain on the doctor-patient relationship. With video conferencing, however, patients get to stay in the comfort of their home and can communicate their concerns more clearly, all without having to stress out about a trip to the doctor’s. Video conferencing makes communication easier, more flexible, and more powerful in every industry. Want to see for yourself? Contact us today! There’s a lot to know about copiers and printers, and it’s important to do the right amount of homework so that you end up with the perfect machine for your business. To help you make the crucial decision (or to brush up on your printer and copier knowledge), we’re answering an important question: what are the differences between inkjet, laser, and digital printers? Although today’s printers and copiers are often multifunction machines that combine printing and copying with faxing and scanning, that doesn’t mean these machines are necessarily more complicated. All you have to do is learn the lingo and you’ll be well on your way to becoming your company’s printing expert. Inkjet printers use traditional ink cartridges in four base colors–black, magenta, yellow, and cyan. Ink is squirted onto the document in various combinations to create all the colors you’ll need to create high-quality photos and text. However, since they can be pricey–usually about $20 per cartridge–these machines are usually best for small businesses. Laser printers are fast and powerful thanks to their efficient combination of three main components: a light beam, a drum, and toner. They can create precise, crystal-clear text prints, and although their upfront cost is higher than competitors and they don’t print on different paper types, they are efficient, reliable, and capable of handling even high-volume jobs. “Digital printer” is actually a term used to refer to laser and inkjet printers, simply because all of these machines have advanced capabilities like wireless communication and cloud printing. The opposite of a digital printer is a wired printer, and digital printers definitely have the advantage here, providing more options at cheaper prices. Want to learn more about printers and copiers like these? Trying to choose the perfect machine for your business? Contact us today! If you’re researching to find your company’s ideal phone system, then you probably already have some idea of how important these systems are. However, have you ever stopped to consider everything the right phone system could be doing for your business? Let us help you set your standards high! Traditional landlines and basic services are going out of style. In their place, sleek and streamlined modern phone systems are beginning to appear–and with good reason. Today’s phone systems are designed to work with a highly technological office, capable of handling your fast-paced needs and complicated goals without once hurting your budget. Customers expect you to be able to communicate quickly, professionally, and with a little bit of tech-savvy wisdom; the right phone systems can make that happen. You shouldn’t be paying for something that can’t do its job. Modern phone systems utilize hardware and software that you probably already have, doing the important stuff without making you work for it. Phone systems are important because they should be able to adapt to the way you do things, making changes only when you feel like you could be functioning more efficiently. Too many big changes at once can be time-consuming and expensive. It’s crucial that your phone system is capable of serving you now and in the future. If it doesn’t seem like it’s capable of growing with you and your business, it’s not the right phone system for you. Phone systems are important–and we can help you find the perfect one. Contact us today! The healthcare industry might be in the business of saving lives, but who is responsible for saving and protecting all the documents, data, and sensitive information that the healthcare industry creates? There’s one simple answer to that: document management. Although document management is a tool that can adapt to fit businesses in every industry, it is especially beneficial for healthcare practices–and that’s because document management is all about protecting what matters. It helps you work within the goals and regulations of your field without wasting time, money, or energy, providing solutions to issues like security and poor file organization. Sure, creating a naming procedure for documents or implementing user authentication software might not save lives like doctors and surgeons, but it does help make things easier. Because document management helps you take advantage of the hardware you already have, adopt more efficient printing practices, and cut out waste in your workflows, it can help minimize the unique kinds of costs that the healthcare industry faces. There are a lot of rules and regulations imposed on any business in the healthcare industry–but with document management, it’s easier than ever to be compliant and efficient. You can boost online security and manage user permissions to help keep data safe and secure, all without wasting time or money. Document management was designed around the idea that, even in the healthcare industry, we’re all only human. Luckily, with document management, it’s easy to automate processes that might otherwise be full of human error, resulting in happier workers and healthier patients. Ready to see what document management can do for your healthcare business? Contact us today! 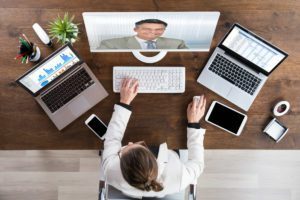 Like most things in the business world, there’s a right way and a wrong way to start video conferencing in your company–and although the tool itself is efficient, powerful, and cost-effective, doing things the “right way” can make it even more beneficial. Here’s a quick look at what that means for your company. Here’s the truth about video conferencing: it’s a great tool, but if you try to use it the same way “everyone else does,” you’re going to run into issues. That’s because video conferencing is designed to be as unique as your needs, goals, and ideals–as unique as your company itself. Trying to implement this tool from a one-size-fits-all perspective will cause you to miss out on some of the best things video conferencing has to offer. This particular video conferencing solution didn’t work at a different company; it must not be right for us either. This combination of video conferencing solutions worked great for someone else. Let’s do exactly what they did! We don’t know precisely what we need, but we’ll find out along the way. How do we plan to adapt our website to this new technology? What specific issues do we want to have solved by video conferencing? Will we need to update our hardware? Ready to implement video conferencing in your company? Contact us today! It’s one thing to choose the perfect copier or printer; it’s another thing entirely to choose the perfect office equipment provider. It’s a pretty big decision, but luckily, it doesn’t have to be a pain. Take a look at these simple tips before choosing your office provider! The printers and copiers in your office are a critical part of just about everything. They help communication run smoothly, they make sure your records are accessible, and they share your brand with the world–but before you can enjoy any of those benefits, you need to find the perfect office equipment dealer. The trick is not to look for a dealer that will “tolerate” you, but to find someone who’s eager to begin a printing partnership with your company–and while that may not sound easy, there are a few simple tips that can help get you started. In today’s day and age, websites can often speak louder than words. Check out a potential dealer’s website before you contact them; this can help you decide whether they seem detail-oriented, professional, and honest, all based on how they share their information and how they handle their online presence. Find out exactly what they offer. A good dealer needs to be able to provide for all of your needs, both now and in the future. Be sure you understand what kind of contracts they offer, what services or demos they provide, how many products they carry, and what their partnership would look like for your company. Make sure they want your partnership. When choosing between dealers, you should always remember that you’re looking for a partnership. If they don’t offer individualized assessments to help serve you better, they’re not the right dealer for you. Need a printing partnership for all your printer and copier needs? Contact us today!